Elizabeth Barrett Browning (1806-1861), Poet; wife of Robert Browning. Sitter in 7 portraits. Michele Gordigiani (1835-1909). Artist associated with 4 portraits. Mrs Browning, like her husband, was a poet and her portrait was painted as a companion piece to that of her husband. According to a label on the back of the frame, it was done 'expressly for Sophia May Eckley and pronounced by Robert Browning to be the best Portrait ever taken of the Poetess' ; but at the time, Robert Browning was not convinced that it was a good likeness and wrote to Mrs Eckley that 'The portrait is not perfect certainly; the nose seems over long and there are some other errors in the face; also, the whole figure gives the idea of a larger woman than Ba'. 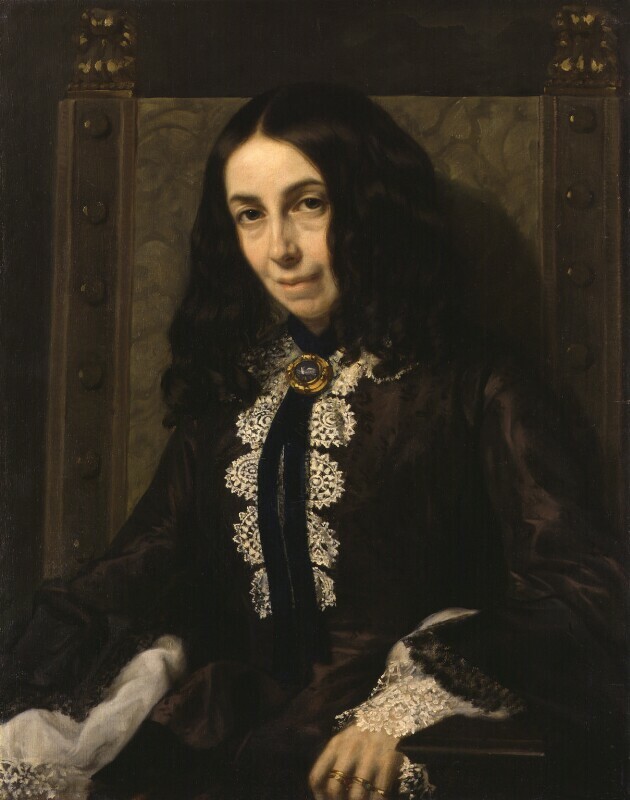 It shows Elizabeth Barrett Browning looking dark-haired and intense and it is perhaps not surprising to learn that Mrs Eckley had introduced her at this time to spiritualism.